Okay, I know it’s Tuesday, and I’m not supposed to blog until Wednesday on my new fancy schedule. I was sitting on the couch and Annabelle was laying on the floor, she’d been rolling around on the blanket I laid out for her. I’d been really excited today, as she was rolling even with her cast, and lifting her leg good and everything. And she was rolling multiple times to try and “get” a toy. This Momma was very proud. Somehow she’d sat up ALL BY HERSELF for the FIRST TIME!!!!! I seriously think I might cry. We’ve worked SO SO SO hard for this and I was beginning to wonder if it would ever happen. 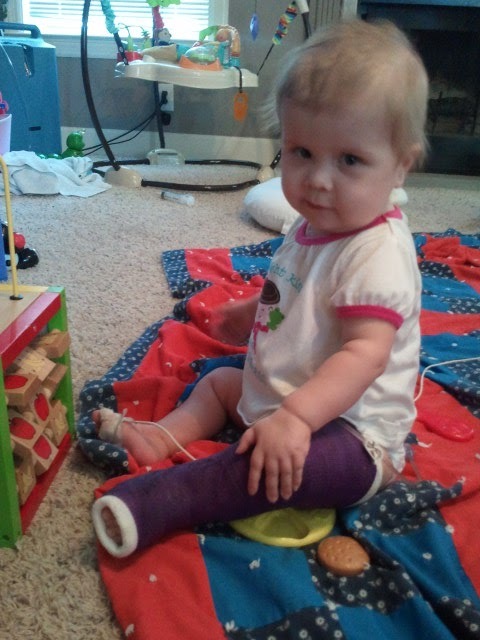 I NEVER thought it would with her cast, but now I wonder if having the hard cast on helped her get a little leverage to sit up. Anyway, back to regularly scheduled blogging! Look! I did it all by myself!!!! Oh my gosh, I LOVE that look on her face. Absolutely adorable! Precious! That look on her face seems to say "What's the big deal, mom?" I agree with you – a very big deal! That little look on her face! "I'm awesome and I KNOW it!!!" Yes! How exciting! We'll let it slide that you went off schedule – of course, any proud mama would understand why! That look on her face is priceless!! It's almost like she's saying, "I could always do it, Mom. I just wanted to do it on my time." Awww LOVE! And that look on her face is absolutely priceless!!! THIS MAKES ME SOOOO HAPPY!!! 🙂 She's getting so big! Look at her, all proud of herself!!!!!! GO ANNABELLE!!!!!!!!!!!! I love the sassy look! Way to go, Annabelle!! !